The Exotic Shorthair, a cross between the Persian and the American Shorthair, has a Persian face, thick short fur, and a friendly, laid back personality. 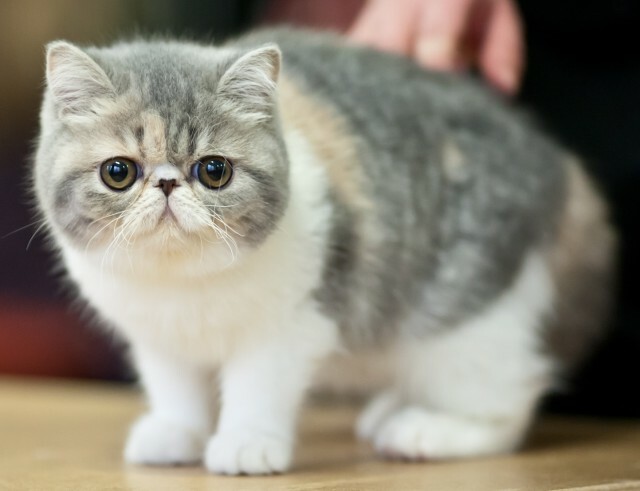 Breeding Persians with American Shorthairs led to the Exotic Shorthair, a short-haired cat with a typical Persian face. Known as the “lazy man’s Persian” because it requires little grooming compared to its long-haired counterparts, the Exotic Shorthair has become extremely popular. Exotic Shorthairs have round faces with short noses and wide-spaced saucer-shaped eyes. Ears are small and set far apart, and have rounded tips, giving the cat a teddy bear look. The Exotic Shorthair’s coat is thick with a plush texture and extremely soft, and it has the cobby body type—round and stocky, with short legs. Exotic Shorthairs are available in more than 70 solid colours, colour combinations, and patterns. Exotic Shorthairs tend to be more exuberant and energetic than their Persian counterparts. Some assert that cross-breeding with the American Shorthair has given them a more lively, boisterous, mischievous side, and many stay playful even into old age. However, like Persians, they also tend to be gentle and easy going. While there are certainly exceptions, Exotic Shorthairs tend to be sociable and friendly, and most are lap cats. Affectionate and snugly by nature, they are inclined to seek physical closeness with their favourite people, and they prefer the company of humans to that of their own species. Exotic Shorthairs tend to be laid back and relatively tough, and so they get on better with children than some of the more timid breeds, though it is still important to teach children how to handle them gently. Exotic Shorthairs are not one of the more talkative breeds. When they do vocalize, it is usually in a quiet, high-pitched voice, and they are also inclined to make chirping sounds. Exotic Shorthairs need far less grooming than long-haired Persian cats. However, because they have a thick double coat, weekly combing is recommended to prevent problems with hairballs. If participating in cat shows, owners are also required to clip their cats’ claws. When trimming claws, use nail clippers specifically designed for claw trimming, and be careful not to cut into the pink part closer to the base of each nail, as this will cause pain and bleeding. 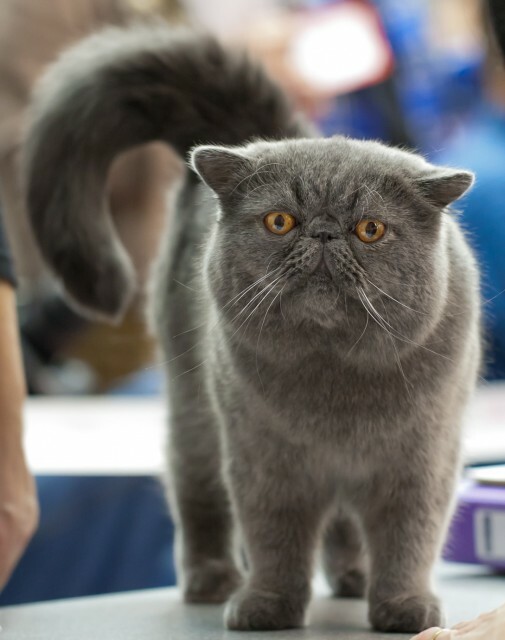 The expanded gene pool of the Exotic Shorthair, which has included American Shorthairs, British Shorthairs, Burmese, and Russian Blues as well as Persians, has made the breed healthier and more robust than many other pure breeds, with the exception of a higher-than-average incidence of feline polycystic kidney disease (PKD), which is also seen in Persians. 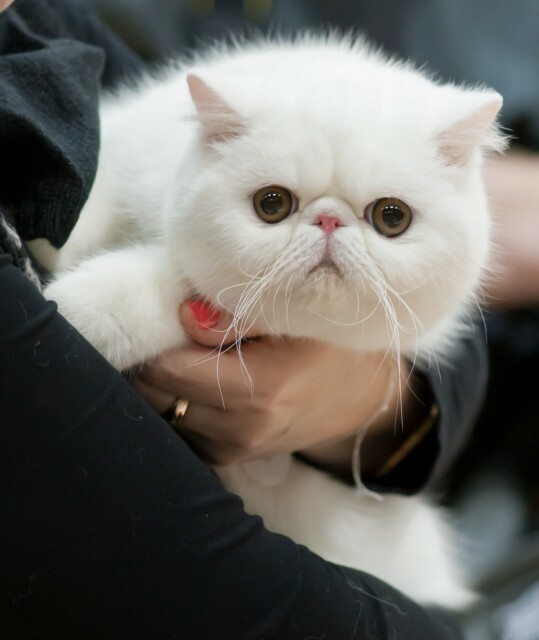 Exotic Shorthairs may also suffer from minor health problems such as the tear duct and sinus issues that also afflict Persian and Himalayan cats. Eye problems such as tears and staining of the fur below the eyes can be relieved temporarily by wiping with a moist cloth over the area or using a commercial preparation. Eye infections and sinus problems such as nasal discharge combined with sniffling and sneezing can usually be treated with an antibiotic. Some Exotic Shorthairs experience dental problems because their jaws develop at an atypical rate, which causes misalignment of the teeth. This may necessitate having a tooth or two removed at some point. Adopting a cat from a reputable breeder decreases the likelihood of health problems in purebreds. Exotic Shorthair kittens usually cost at least $350 and can run as high as $3,500 depending on bloodlines and show quality. A list of Exotic Shorthair Breeders can be found at the Cat Fanciers’ Association website. Those who wish to save money and provide a home for an adult Exotic Shorthair in need can look into the Persian, Himalayan, and Exotic Shorthair Breed Rescue Organizations at PurebredCatBreedRescue.org. Commings, Karen. (1999). Guide to Owning an Exotic Shorthair Cat. Neptune City: NJ: T.F.H. Publishcations, Inc.
Gilbreath, Laura. (29 August 1995). “The Exotic Shorthair: Cat Breed FAQ.” Fanciers.com. Sims, Barbara, Cat Fanciers’ Association. (22 May 2008). “Breed Profile: Exotic.” CFAInc.org. this is a really interesting article. it is full of information and it helped a lot with my research paper. thank you a whole lot for writing it.